What a great fine, recommended by a friend. We had spent the day tooling around the Georgia coast and decided to return home via Fernandian Beach. After checking out the usual tourist stuff we headed over to the restaurant. 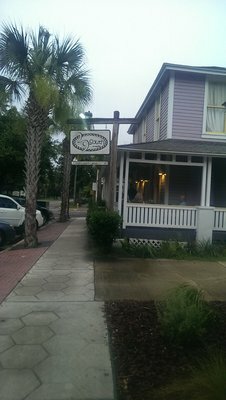 A beautifully restored old house, where diners can lounge on the wrap around porch and people watch until your table is ready. Although it is two stories only the bottom floor is open for dining and drinking. The restoration inside is quite striking and well sectioned out. The vibe is very upscale and chic but not in a stuffy way. We were seated promptly in the smaller of the two rooms which was a plus for us. Our server arrived with water and menus in seconds. Took our drink order and upon his return went over the specials of the day. This man knew his stuff and any questions we had about the menu, food or preparation he easily responded in a most knowledgeable way. I find this ability lacking in many restaurant servers thus I became a fan. The dinner menu is a delightful mix of small plates, salads large and small, sandwiches, entrees, a selection of sides and of course the sweets. There is also an impressive wine list. We were also informed that the restaurant uses local products when available and they do grow many of the greens in the back of the restaurant. 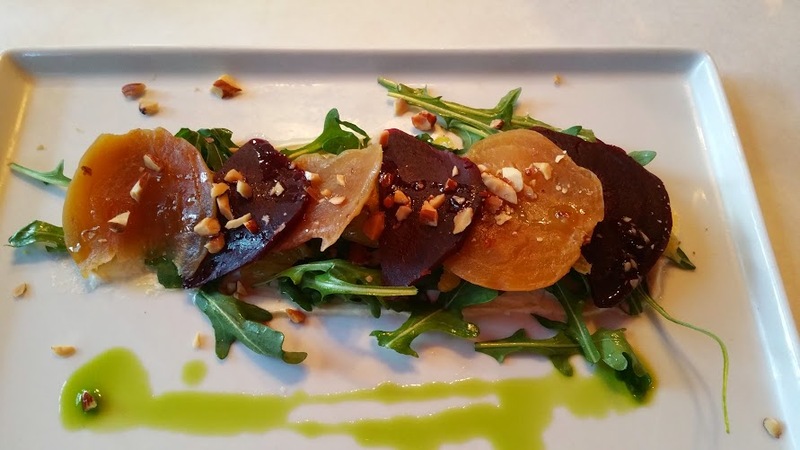 I am all into the sustainable trend that has become so popular in restaurants. It’s a win win for the growers and the diners to have the freshest food possible. I started with the Smokehouse Mussels Prince Edward Island Mussels in a Smoked Tomato Marinière and my companion the Roasted Beet salad. 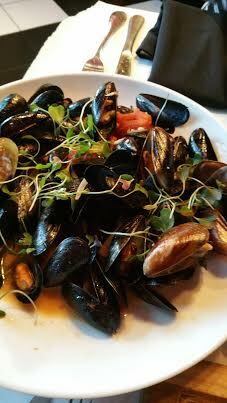 The mussels were plump but smaller than expected, yet plentiful so ample portion, the smoked tomato (these are smoked in-house) add layer of taste not normally found in a tomato based dish. We then moved on my companion choosing the Fried Chicken, beautifully described on the menu as “drizzled with Naked Bee Honey” who would not want to eat that? 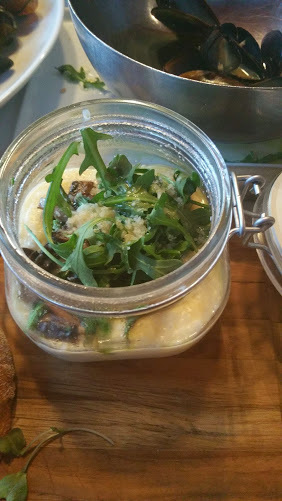 and I chose the Jar of Polenta Creamy Anson Mill Polenta with Roasted Mushrooms, Asparagus, Truffles and Pecorino. I have only seen this on a menu one time and that was in Napa Valley and I had it then and was hoping it was not going to be disappointing now. 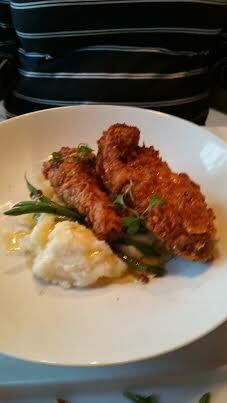 The chicken was nicely presented, beautiful brown and crisp. The Naked Bee honey brought out the color from the chicken and as promised drizzled over the mashed potatoes with just a hint of green from perfectly prepared green beans. My Polenta was just what I had hoped for when it arrived. The trick was going to be the tasting. 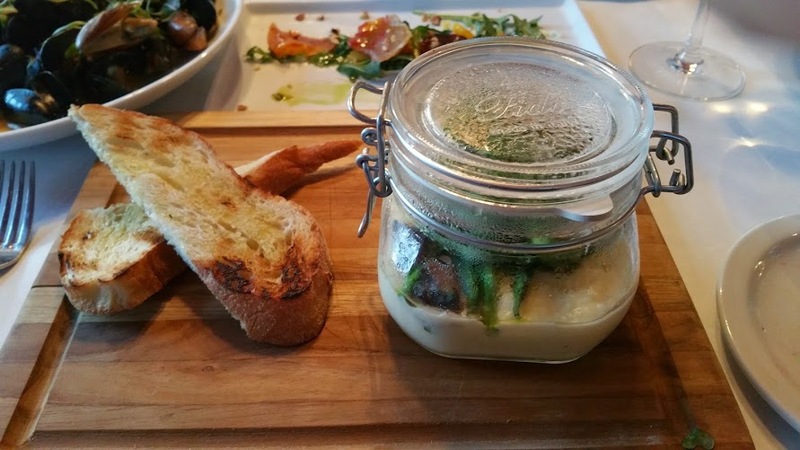 Once the jar was opened the steamy rich earthy aroma of the mushrooms filled my senses. Amazing!! One of the best dining experiences I have had lately. We toyed the thought of something sweet, a temptation we were both able to overcome. It was dark when we left but I will make it a point to look at their gardens when we return. This will definitely be a destination for us in the future. Make reservations at night it is quite busy and seating is limited.